I found these old photos from the FA of upper Sentinel Falls. The quality is marginal but they are of some interest. For those of you who don't know Sentinel Falls is a 2,000ft or so waterfall just west of Sentinel Rock. It has an interesting history as an ice climb. 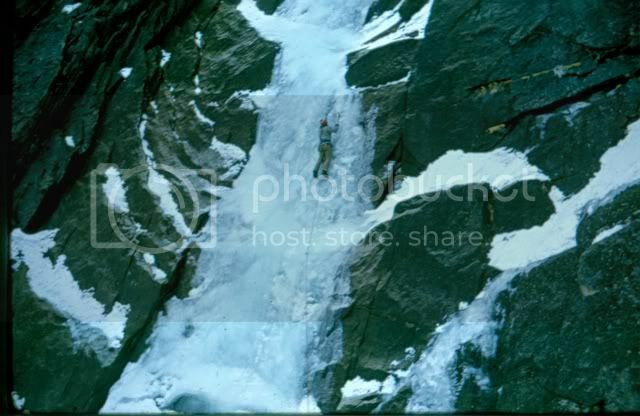 Kevin Worrall, Jim Orey and I did the FA of the upper falls in Dec. 1974. 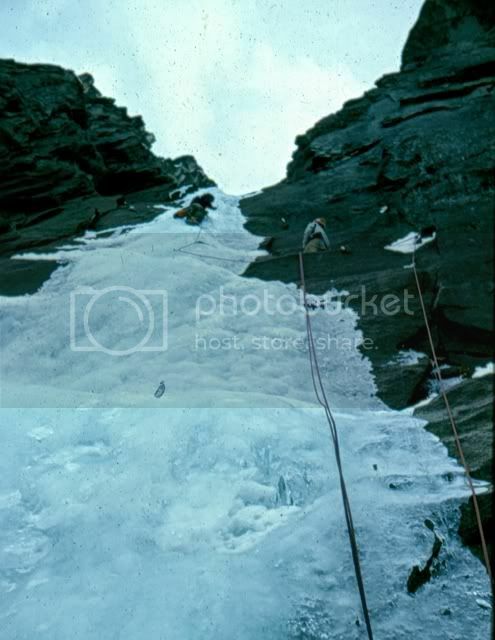 This was the first real ice climb done in the Valley. Later, the lower section was climbed... by who first I am not sure. 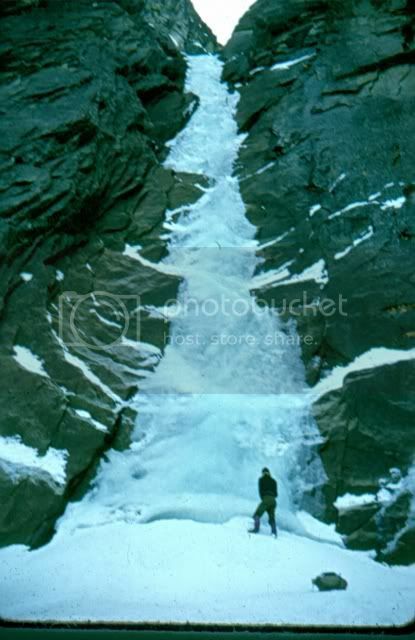 The entire falls has only been climbed once in a stupendous effort by (I believe) the late great Walt Shipley and Kevin Fosburg. (Please chime in KF)Our ascent was a fun adventure for the three of us--ice novices all. Charlie Porter first pointed out the climb to me in the spring of 1974. The previous winter Charlie had climbed some ice flow in the meadows and was interested in other potential ice climbs in the Yosemite including the Widows Tears. I had always had a interest in alpine climbing (as many of my generation did) stemming from my introduction to climbing through reading the history of the classic ascents of the Alps and other great ranges. Some element of adventure always seemed to be missing from my Yosemite climbs on the Valley's perfect sunny granite. There was a renaissance under way in the sport of ice climbing. Chouinard, among others, was busy reinventing the tools of the trade. 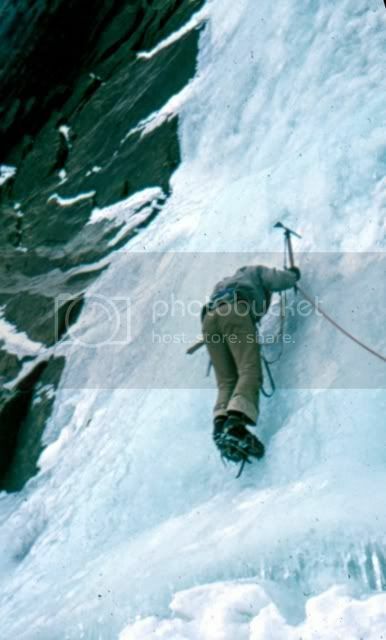 The concept of climbing water ice as a sport unto itself was becoming a reality. 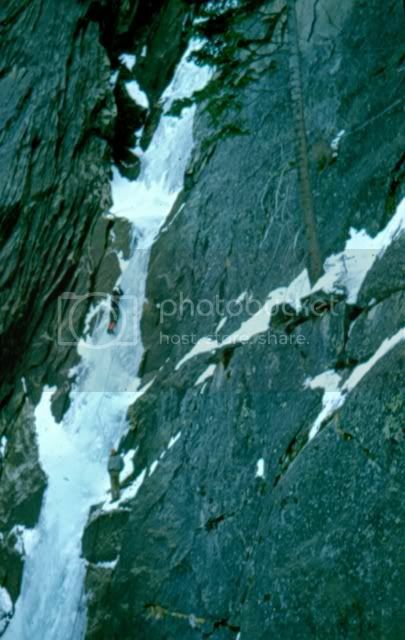 I believe Jello and Mike Weiss made their ascent of Bridalviel Falls at this time. I was eager to participate and in the summer of 74 bought a collection of ice gear from a climbing buddy of mine in the bay area. As it came to pass one sunny December day in the Valley Kevin, Jim and I were all sitting atop the large Yellow pine in Leidig meadow. We had a perfect view of the Falls and formed our plan there. We would hike up through the forest and talus below the Falls, traverse up a ledge system leading to a parallel gully to the west, ascend this until we could traverse back to the upper falls. It all went according to plan. We made our way up the appraoch, which took us a day, and bivied on the ridge seperating the two gullies. The next day we continued the approach and soon had our first glimpse of the climb. I was so excited. I had never seen anything like this. A frozen waterfall!! What could be cooler than that? We made our way to the base. There was this little minny bergschund at the base forming a perfect little mouth with icicle teeth. None of us had every climbed anything like this before and we didn't really know where to start. We pounded in a warthog, clipped in a rope and all gave it a tug. It didn't pull out, so figuring the pro was good, I started up the first pitch. My climbing attire was a bit lacking. I was clad in corduroy bell bottom jeans (hey, it was the seventies)with no gators. I gingerly made my way up the near vertical ice for about fifty ft taking my first chance to exit onto the rock and belay. Jim followed this pitch first and then led a short steep section to an obvious bowl. Kevin must have led the next pitch and then I was on the lead again. By the time I finished leading the last steep section it was dark. Kevin and Jim followed. I remember being so cold at the belay, tied to this pathetic scrawny pine sapling. I was shivering away in the shade of the bright winter moonlight beliving that as soon as the moonlight reached me I would warm up. We endured our second bivy here. It was one of the longest coldest bivies of my climbing life, right around the winter solstice. Finally, dawn arrived and we made our way up the last low angle pitch to the Valley rim. We postholed east under Sentinel Dome and then headed for the Four Mile trail which took us the Valley, sunshine, and food. Shortly there after Jim took leave of us and Kevin and I turned our sights to the obvious encore--the Widows Tears. I missed one photo. Kevin at the base of the route. That's fat! Cool shots from when the piolet was king. Thanks Mark. How are you? Very cool to hear this story. Are you still in contact with Jim? The first time I met him was the same year at Lovers Leap. He walked up to the base of the Line in his tennis shoes and a six pack. Gene Drake and I dropped him a rope and he cruised the route with his six-pack dangling from a carabiner. I'm loving your stories from the way back machine. Now that is cool...good effort getting those posted. I'm lucky I'm getting to see this stuff. Great shots of a really cool and historic adventure. Many thanks for posting Mark. Wow. I don't know where Jim ended up. We did a fair amount of climbing together back in the day. A great guy and a great climber. I first met him when I did the nose with Rieder in 72. 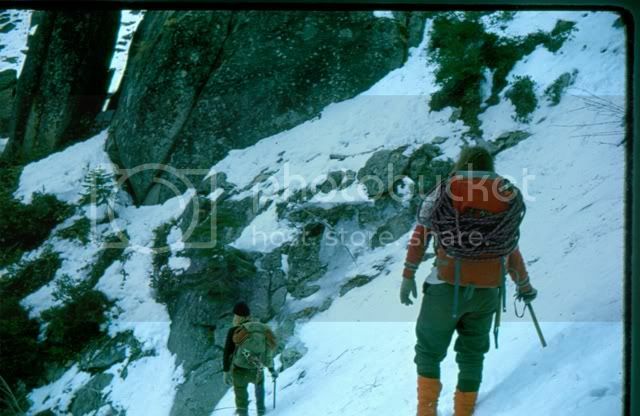 He was on the Muir Wall with Jack Roberts and we exchanged hellos as he and Jack headed into the Muir dihedrals and Rick and I entered the Nose dihedrals. 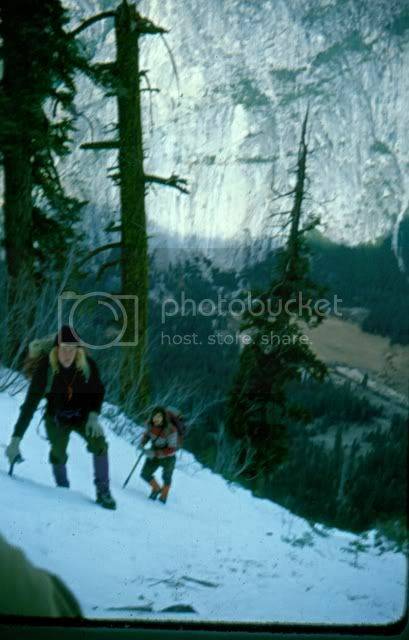 In the fall of 74 Jim and I did the 4th ascent of Tis Sa Ack. He did the entire route with only a swami belt using only the classic aider rest possition! We also did an ascent of the N face of Mt Assiniboine and the FA of Eagles Way together. He also the FA of pitch one of Hardth (Spelling??) at the Cookie. I'll post a photo of him. Gene has been in contact with him and I can find out how to get a hold of him for you. I will say hi to Hayley. 426, I sent you an email. I loved the images. I think that it's important to distinguish the two, photographs and images. We can criticize photographs in terms of technique, focus, exposure, composition, contrast, color saturation, etc. But as images, the ones you have posted have a great deal of authenticity and power. Especially when there is a narrative associated with them, as in this case, and an importance — such as a break through First Ascent. Thanks Ed. I agree. I love historical images. Recently I purchased Glen Denny's book which works on both levels--great photographs and timeless imagery. Over the years my equipment and technique as a photographer improved a great deal but what I wouldn't do for a second chance to relive so many great moments I missed recording with any old camera at my side. I am thankful for what scant images I do have. I have a photo essay on Kev's and my ascent of the Tears as well. I'll post it soon. I remember at that time barely having the money for a single roll of Kodachrome. wow! is right! rad Mark! anyone (not just Chappy) that digs up old pics and scans and posts them is right on! Wow...thanks for taking the time to share that! Nice TR Chappy! I'm not a big fan of ice climbing, but your post made me want to give it a try! Mark thanks for the awesome story. I look forward to reading about the tears. You guys are true adventures. Paging Kevin Fosburg, bring on the trip report from your ascent.